Uglyworld #593 - Ice Cream Dream (157-365), originally uploaded by www.bazpics.com. With the weather outside topping 30oC today here in Aachen, the guys are all having fun in the garden running between their toys, the swimming pool and their towels which are all spread out around the garden (for when they need a well earned 10 minutes nap before starting all over again). Ice-Bat is the one feeling the heat the most today, and the last time he woke up he looked so happy that Babo asked him "Why is yous so happys?". 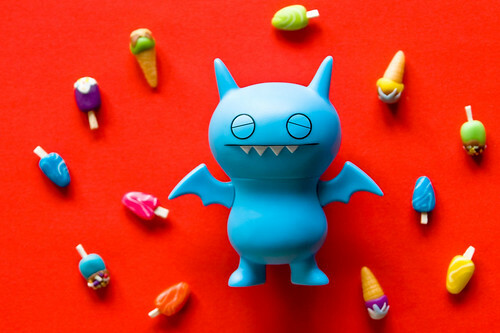 To which Ice-Bat replied, "I hads the mosts amazings dream ever, I was surroundeds by ice-creams of all kinds and coulds choose any of thems I likes!". Within the next 20 seconds all of the uglies were lying on their towels trying to quickly fall asleep so that they too could have an "Ice Cream Dream".